Adult male Drosophila affinis on glass. Unckless et al. Image courtesy of David Duneau. The March issue of GENETICS is out now! Check out the highlights below of the full Table of Contents here. In breeding studies a distinction is made between the genetic value (additive + epistatic genetic effects) and the breeding value (additive genetic effects) of an individual, because some of the epistatic genetic effects will be lost due to recombination. Akdemir and Jannink argue that the breeder can take advantage of epistatic marker effects in regions of low recombination. To this end, they develop and illustrate the use of multiple kernel models for genomic prediction and association. The models provide good predictive performance along with useful explanatory information. Chen et al. report high-efficiency CRISPR-based gene targeting in Drosophila cystoblasts, which each develop into a single female germ cell and therefore guarantee independent targeting events per individual offspring. Compared to direct embryo injection, the new system allows efficient re-trials of large inserts or difficult loci. The system includes a repressor-based lethality selection to facilitate screening and can be readily scaled up for high-throughput genome editing. The ABC transporters White, Scarlet, and Brown are critical for proper eye pigmentation inDrosophila. Grubbs et al. cloned the three orthologous genes from the beetle Tribolium castaneum, characterized the promoters of all three genes, and analyzed eye-color mutants to identify lesions that will provide a new tool for analysis and genetic transformation. They also consider how these genes and eye pigmentation have changed during insect evolution. Better understanding adaptive genetic responses to climate change will help predict range shifts and assist management of biological diversity. Jaramillo-Correa et al. identified 18 SNPs associated with climate in maritime pine (Pinus pinaster Aiton), an outcrossing, long-lived, keystone forest tree. Alleles at the candidate loci were successfully used to predict maladaptation to climate in a common garden under hot and dry climate conditions. Populations with low frequencies of locally advantageous alleles showed increased mortality, suggesting that distinct gene pools will decline to different degrees. Although the vertebral column is highly diversified between vertebrates, the number of cervical vertebrae within mammals has been fixed for more than 200 million years. Kromiket al. report the first known mammalian spontaneous mutation that changes the fundamental seven-cervical-vertebrae blueprint. The mutation alters the T/brachyury gene, which plays a role in neuro-skeletal development. These data show the T protein is directly involved in the maintenance of the mammalian seven-cervical-vertebrae blueprint. The Cholinergic Gene Locus (CGL) encodes two genes required for release of acetylcholine; one gene is nested within the other, and the two gene products arise by alternative splicing. Mathews et al. report a novel form of splicing regulation in the C. elegans CGL mediated by two sets of complementary sequence elements. These sequence elements are able to form stem-loop structures in the pre-mRNA, which may favor specific alternative splice forms. The authors find comparable CGL elements in most animal phyla genomes, suggesting the mechanism is conserved. Accounting for G×E interactions can improve complex trait association studies and our understanding of genetic heterogeneity. However, G×E interactions can be difficult to find, as they require much larger samples and are sensitive to the misspecification of main effects model. These issues are exacerbated when working with binary phenotypes and rare variants. Zhao et al. present a powerful, robust method to evaluate G×E for common or rare variants with binary traits. 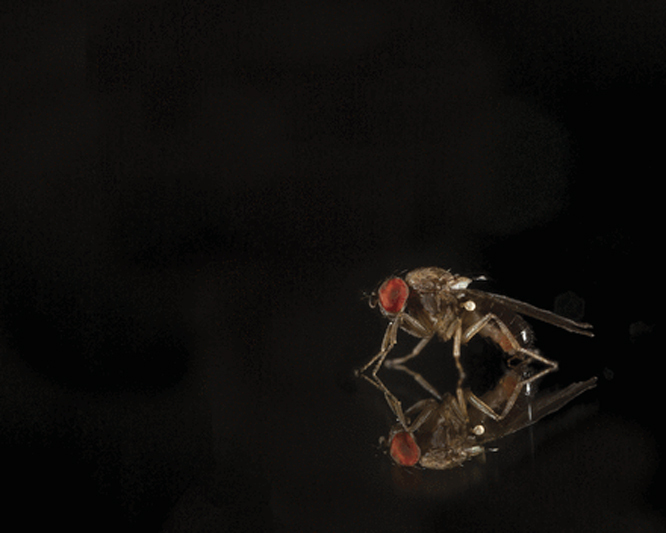 NIH and NSF funding for Drosophila research has declined in recent years, despite the model’s numerous significant contributions to biomedical science. Wangler et al. highlight the strengths of Drosophila and argue the field will continue to reveal important biological insights that can be translated to human disease research. They argue that collaboration between Drosophila geneticists, human geneticists, bioinformaticians, and clinicians will improve the functional annotation of both genomes, providing important data for the diagnosis, study, and treatment of genetic disorders.